In a latest development in the food poisoning case where over 50 people including women and children were admitted to the Panery Subsidiary Health Centre in Udalguri district of Assam on August 18 last, one Jinti Kalita, aged eight years and a Class-III student of Pub Paneri HS School who was undergoing treatment died on August 21 at Gauhati Medical College and Hospital (GMCH). Sources said the girl along with hundreds of women and children took part in a ‘naam prasanga’ organized by one Nakul Patowari of Paneri, at the Pub-Paneri Bishnu Mandir on August 17. After the consumption of peachicks and ‘laddus’, made from home-made rice powder (pithaguri), many of the women and children started feeling dizzy. 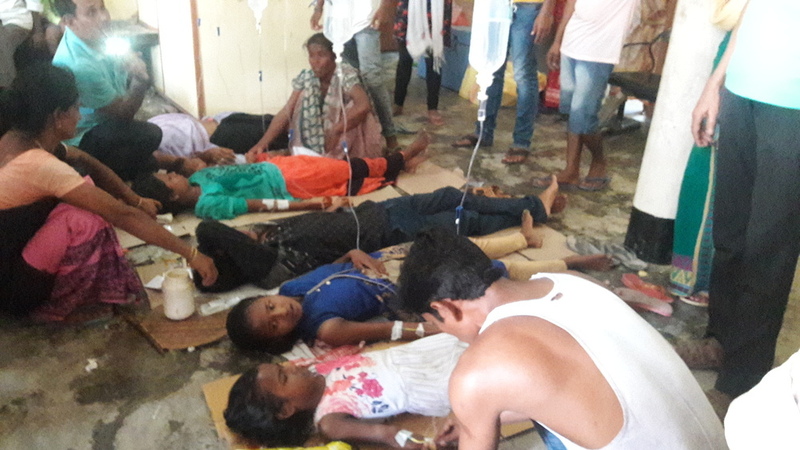 Several children and women developed serious complications and were immediately rushed to various hospitals located at Tangla, Udalguri, Mangaldai and Guwahati on August 18 in critical conditions. After the death of Jinti Kalita, the infuriated locals assembled near the house of Nakul Patowari who had organized the religious function at the Pub-Paneri Bishnu Mandir. The agitated people started attacking the family of four in the afternoon of August 21, but the timely intervention by police and paramilitary forces saved the family from public outrage. Meanwhile, an FIR registered against the husband-wife duo of Patowari family by one Jayanta Kalita at Panery police station vide case no 65/18 under sections 272/273/328/304/34 of IPC has led to the arrest of both, informed office in charge of Paneri police station,Sohrab Ali. They are currently undergoing treatment at GMCH and further investigations are on, he added. Reportedly, health conditions of three other children – Dibyajyoti Lahkar, Biswajit Lahkar and Dhritiman Sarma – are still critical and all of them are undergoing treatment at the GMCH. One Bhabindra Patowari (70) is also undergoing treatment at Apollo Hospital in Guwahati.